In here three weeks ago. had an hour waiting for my train. Beers were good and a nice selection of a few that I had not tasted before . Managed two before my train. Staff were efficient and friendly for a station pub. Normally I would not comment on a previous reviewer but I have noticed on this forum that there is a significant bias against Spoons pubs. Probably a class thing as I hear so many comments about Elderly Warmers or the Non Workables in other Spoons pubs. Well this is one of the best Station pubs of any owners. Good bee,r Good service and Good prices. What's more to like. With 30 minutes spare between trains in Leeds this morning, we elected to search out this Wetherspoon's branch in the station itself. It's tucked away next to a number of fast food outlets. You can also access it from the station's taxi rank. There is an alfresco drinking area overlooking said rank. Service was efficient and a screen shows train departure times. Ales were Greene King IPA & Abbot, Sharp's Doom Bar, Leeds Pale, Best & Mutiny, Goddard's Wight Squirrel, Ilkley Ruby Jane & Cairngorm Black Gold. The cider was Gwynt y Ddraig Black Dragon. I chose the Mutiny, which was billed as a coconut stout. But the coconut taste was only very faint. Decent choice when changing trains. But, if in Leeds for a longer period of time, it is best to venture further afield. A Sunday afternoon visit while I had a 45 minute wait between trains. 10 ales on the hand pumps, I had a decent pint of Dukeries Farmers Branch @ 5.0%. It was pretty busy but with plenty of bar staff on, the service was quick and attentive.I have used this 'spoons several times over the last few years , its one of the better station pubs, never problem getting served, pleasant clientele and decent ale. Obviously a Spoons which is easy for a train you need to get. It is quite pricey for Spoons ale but it's quite nice. I find Spoons ale can be okay but not good. 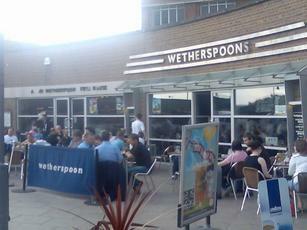 This spoons does nice real ale and the staff are quite nice and considerate when I've been in. Can be good if you want a pint or two before you're off out as well if you've come in by train. Very handy place for a quick one when there is little time between trains, which is why I am a frequent visitor (there are pubs I prefer to visit not far from the station when time permits). However, the ale here is always in good condition in my experience, and I enjoyed a quick pint of Saltaire Elderflower Blonde on Saturday evening. The place was very busy as usual.